As I see it, this is a matter of respect. I read recently that McDonalds serves an entire cow every minute. The process of tanning the hide of a beast is time consuming, therefore the odds of a cow becoming a belt are unlikely. Millions of cow skins are basically wasted everyday, or more likely they are just fed to pigs. To take one hide and turn it into a tool case that might last years celebrates the animal's sacrifice. You could say the same about a steak dinner, but that satisfaction is fleeting. I still could not personally skin a beast, so I still feel a little hypocritical. Regardless, I am enjoying the learning process. 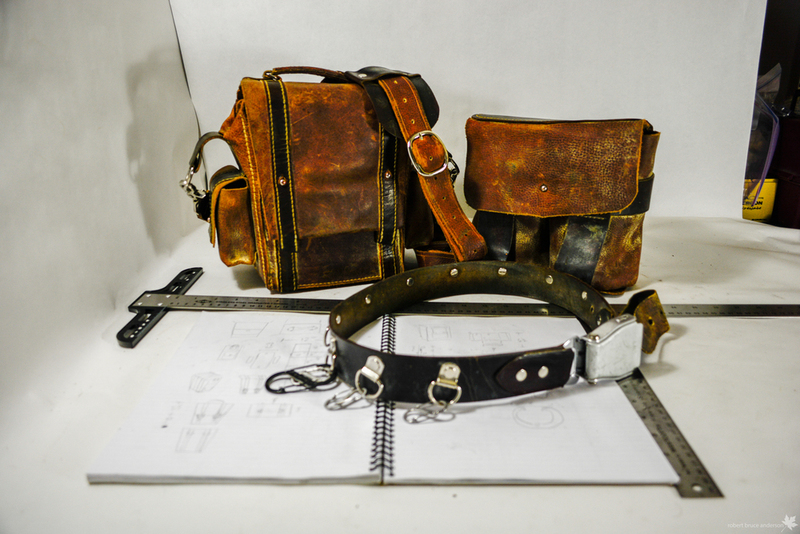 Leathercraft is similar to papercraft in many ways. It also has elements of sewing involved, but the scale is much larger. Then, there is the artistic embellishment aspect which I have barely engaged with. The perfect leathercraft item, to me, is highly functional, first and foremost. It is beautiful at a glance, but mostly it is ergonomic and intricate, which is not appreciated initially. 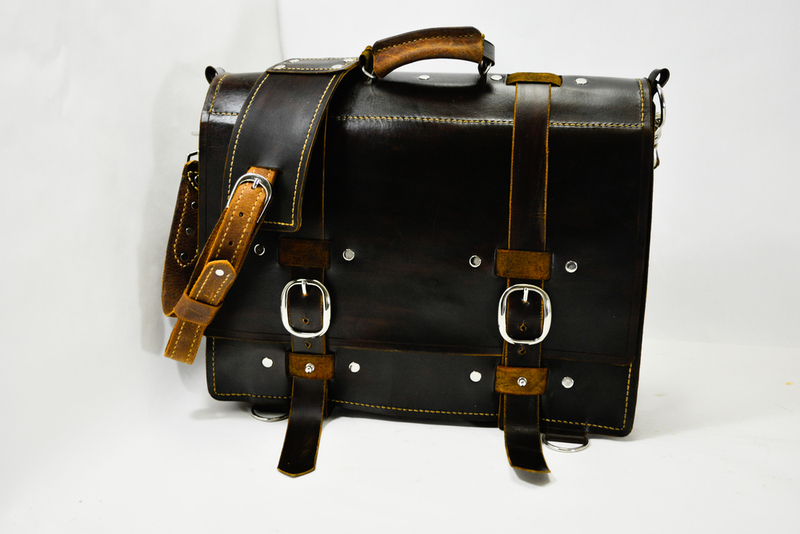 This bag is composed of goat hide and horse hide. It has a red cloth interior with padding. It has a semi-rigid inner layer. It is designed to hold one DSLR camera and one accessory. There are two additional side pockets. 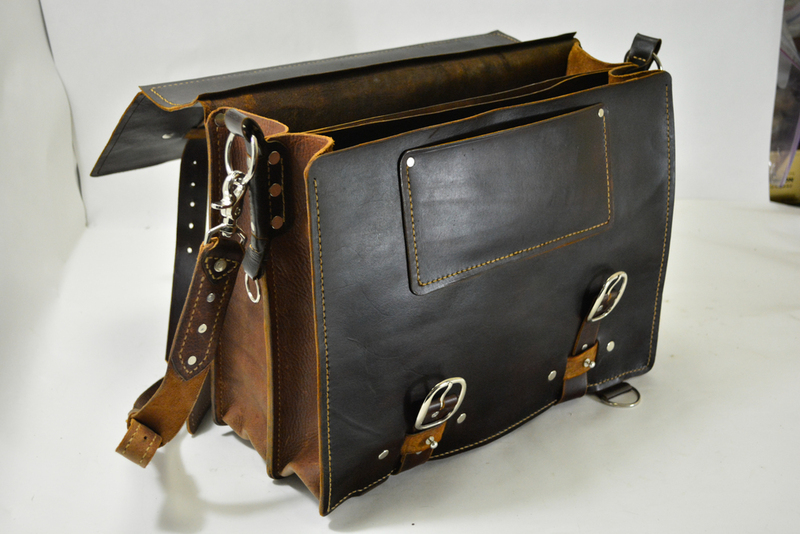 Currently, my goal with leathercraft is to practice projects which have wider appeal. This bag is 16 inches by 12 inches. 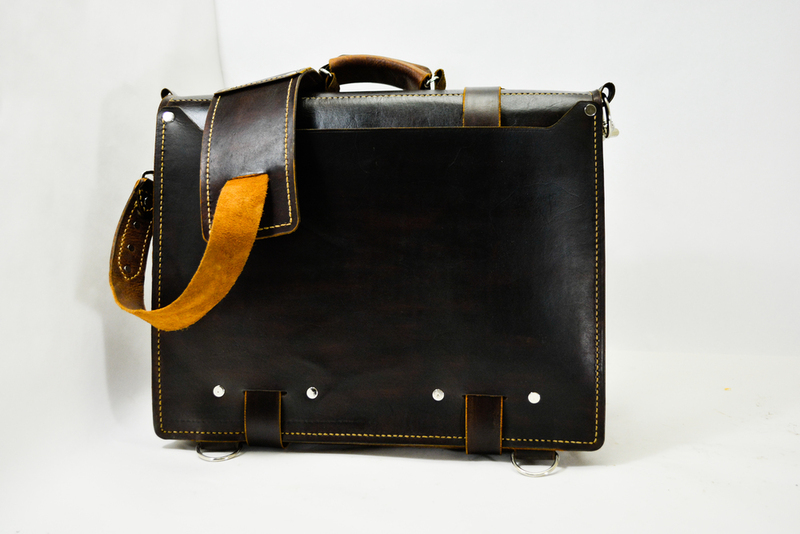 It features veg-tan cowhide dyed medium brown, as well as a softer finished hide style called 'kodiak'. The front section has 3 flat pockets for small notebooks or whatever. It also has two larger pockets with covers and stud closures. These larger pockets are sized to fit a charger cable for a macbook. The second pocket just holds various wires and connectors. The back section is just open space. I had some ideas on how to make an organizer for the back section, but I decided to just leave it as space. 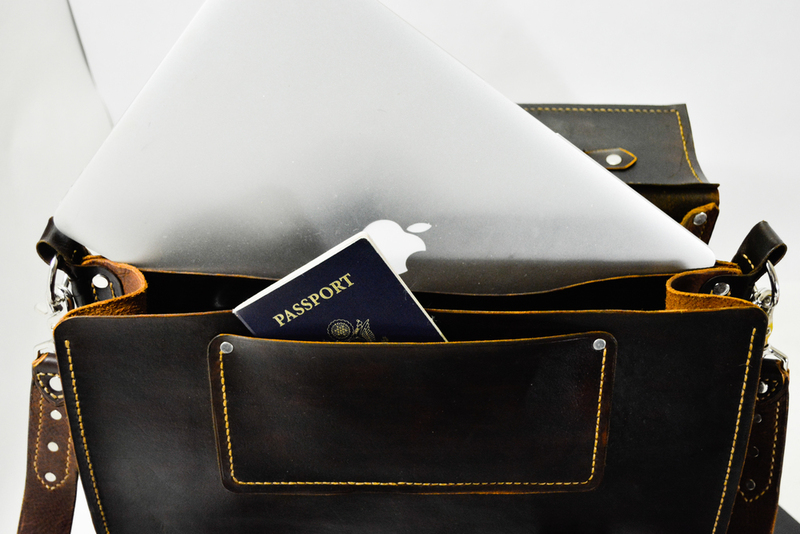 The middle divider holds a macbook air securely. I believe a fatter laptop would fit too. I am pretty happy with the whole thing. The only real issue I ran into was with the buckles. They work great, but it is basically impossible to open the bag with one hand or while its on your shoulder. I added studs to the front so that I could close the bag securely with one hand. I will still use the buckles for more security if I know I wont needing to get into the bag anytime soon. My camera holster project has evolved into a full camera bag. This design is my own creation. It features a rigid divider with a soft covering that securely holds my camera by the body and not the lens. The side pockets are ample to hold batteries and charger. I can fit a small second lens in the bag itself. The lens holster is designed to be worn on a belt. It holds two large sized dslr lenses. Both creations are still completely filthy after having endured Burning Man 2015. 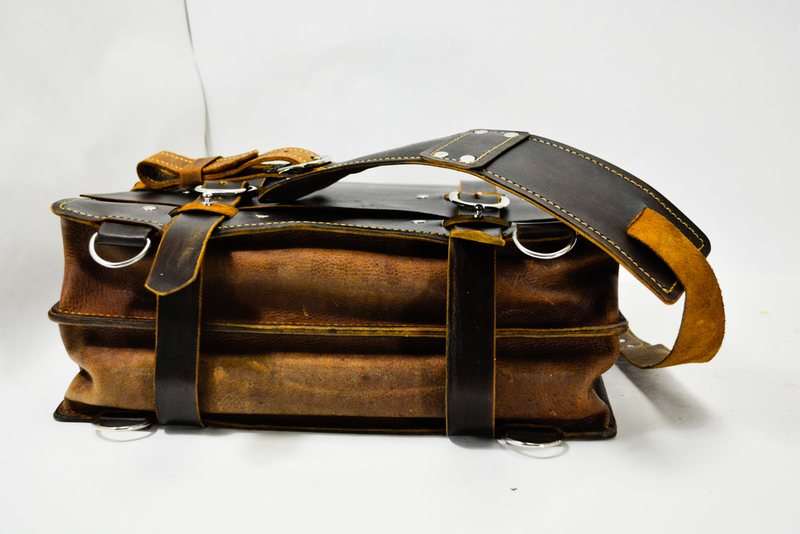 The latest version of my camera case incorporates a belt and leg holster section. The belt is a bit heavy and ungainly, but the holster is sound. The camera hand strap is the best part of this project. I use it regularly on my D5200, though I am using my N60 to model it here. These are three prototype camera holsters. When clipped to a belt using carabiners, this design securely holds a DSLR camera. One major goal was to support the camera's weight on its body, and not the lens. The semicircular edge on the opening is the main contact point, leaving the lens untouched. The first two prototypes work as convenient pen organizers, as well as cup holders. The upper flap was added to the third version, which functions as a guard against doorways and tables when holding a camera. It also adds an ergonomic placement for your thumb when drawing the camera. All three of these are functional, but my design is evolving. My current work in progress will have much cleaner seam lines and professional edge work. I would like to incorporate a securing strap which would connect across the opening to hold the camera in place for transit. This could be problematic, and I can envision several ways it may obstruct use. In an effort to learn how to craft leather, I made these specialized leather holsters for some of my most used tools. The end results are highly functional if not completely beautiful. These are built to last.